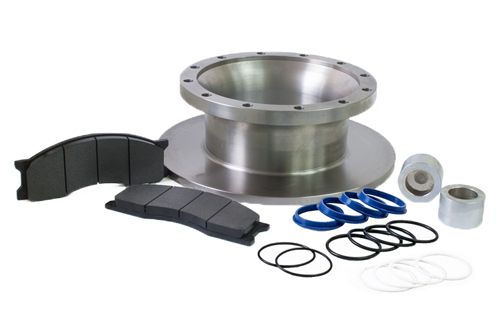 Disc brakes are the most common type of brakes that are used not only in the motor vehicles but in a variety of industrial systems, equipment and machines as well. The structure of these brakes is comprised of: brake pads; caliper located next to the frame; and rotors which are located next to the wheel hubs. The brake pads consisted in the structure of the disk brakes are made from high-quality metal or ceramic materials, which is one of the most important factors that make them resistant to water, ice, mud, air humidity and high temperature. As we said before, there are many industrial systems and machines where the industrial disc brake is part of the braking system. Below, there is a simple overview about the most common industrial fields, machines and equipment where the industrial brakes are used. Material Processing IndustryIn the metal processing industry disc brakes are used in various application which consist a certain material processing method. For instance, an industrial disc brake can be found in dynamic industrial applications such as hauling, forging, rolling and coating and finishing. Mining IndustryMining is one of the industries where mostly heavy-duty applications are performed. Some of the heavy duty machines that operate efficiently by using an industrial disc brake are: winders, hoists, grinding mills and conveyors. Lifts and EscalatorsHave you ever wondered how lifts and escalators are operated, and how can they be stopped? You probably did, we’ve all questioned such questions about how these systems work. The truth is, the elevators, escalators and other similar system are operated efficiently and safely thanks to the power of the disk brake systems. Energy Production IndustryIn the energy production industry, industrial disc brakes are used for many purposes in a variety of operations, among which the most common are controlling the speed and motion of the wind and tidal turbines as well as stopping and holding the draw works. Marine and ShippingThe most common industrial braking solutions that are specially designed for the marine and shipping industry include: main propulsion shaft, weapon systems braking systems, thrusters braking systems, winch drive braking systems and more. EntertainmentIn most of the equipment in the entertainment parks (theme park rides, monorails, simulators, etc) the safety and optimum performance is a result of the use of an industrial disc brake system. This is because these braking systems are involved in crucial operations such as speed control and management, emergency braking and static holding. This entry was posted in Electronics and tagged braking, industrial disc brake by australiaonline. Bookmark the permalink.